Today I’m thrilled to have Kai Klement on the show. Kai is someone who reached out to me with an incredible story and I knew that I needed to have him on the podcast. Kai and his partner Jorg(yerg) are the co-founders of Kavaj (kavai), an internationally top-selling leather case manufacturer for phones and tablets. They’ve sold over 500,000 cases generating over 17 million in revenue. They both started out as former Amazon employees with zero knowledge of manufacturing, or product creation and ended up creating this awesome ipad and phone case company. Enjoy the interview! Kai’s motivations for starting his business. Now before we begin I just want to give a quick shout out to famebit.com for being a sponsor of the show. Famebit is the number one market place for influencer marketing with over 20,000 Youtubers, Instagramers people on Twitter and vine looking to promote your company in any vertical whether it would be beauty, tech, gaming, pets and more. Yes, you can get famous Youtubers and Instagramers to promote your business for as low as $50. 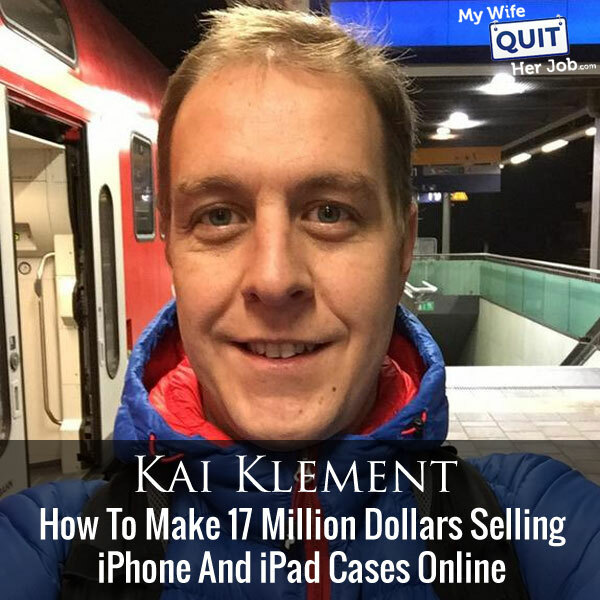 Steve: Welcome to the My Wife Quit Her Job Podcast, today I’m thrilled to have Kai Klement on the show. Now Kai is someone who reached out to me with an incredible story, and I knew that I needed to have him on the podcast. So Kai and his partner Joerg are the co-founders of Kavaj, an internationally top selling leather case manufacturer for phones and tablets. Now they’ve sold over 500,000 cases generating over 90 million in revenue on a span of about four years. Now they both started out as former Amazon employees with zero knowledge of manufacturing product creation, and they ended up creating this awesome iPad and phone case company, and with that welcome to the show Kai how are you doing today man? Kai: Thank you very much for the nice introduction Steve, I’m very well thank you, how are you? Steve: I’m very good; I’m really excited to hear your story here. So give us the quick background story about Kavaj, how you kind of came up with selling genuine leather cases online? Kai: Yeah, it’s very easy actually, so in 2010 when Apple launched the first iPad, Joerg — he wanted to have one, he was very, very keen on it. And by the time this case was only available in the US and as we founded our company in Germany, so we had to get it somehow. Joerg asked a friend who was a pilot at Lufthansa during the time to get one in New York. And once he had his iPad obviously he needed a case. So we both were looking around, checking out Amazon in particular what was available, because Joerg and he had his dream case already in his mind. His dream case was a thin genuine leather case. And by the time nothing like this was available online and nothing available on Amazon nor somewhere else. This was like the turning point, then we thought okay let’s do it. We will produce our own case and we — yeah first we do it for us, and then second we do it for everyone else, because there was nothing around we liked. So it’s like the story how we came up with the idea. Steve: It was — your primary motivation was because Joerg was looking for an iPad case? Kai: Exactly, this is a private motivation, so it’s the passion for — we needed first ourselves and then yeah let’s do it. Steve: Were you guys both working at Amazon at the time? Kai: Yes, exactly this was the background, we both we used to work Amazon before we started Kavaj and yeah. Steve: So did you start this while working on Amazon, or were there any rules about that? Kai: Yes, exactly we started while we were working there; obviously it was not allowed like to build your company besides working there. So we did it like everyone else was doing it, who has this entrepreneurs [inaudible 00:05:19] like we used a company which was led by my wife, and then we were kind of advisors for her obviously we were running it all. Steve: This first case was not leather though, right? Steve: So before we get into like the product creation, I was just a little bit curious since you mentioned that you formerly worked at Amazon, did working there actually help you guys at all, and what did you learn from Amazon that kind of gave you the courage, or helped you sell this product? Kai: Yeah, definitely it helped us. This was our idea in the first place to get into cooperate business for 2 or 3 years in order to learn as much as possible about business, about running businesses. And one of the most important things I think we learned even while working at Amazon is like to be so customer focused is one of the key factors of your success. Like this was the first reason in the first place I used to work for Amazon because I was such a happy customer. Okay, I said, I have to work for this company because they are so customer centric. And while working there we recognized they really lived this kind of customer philosophy also internally. Every project, everything is like, on the top as the customer. If you have a reason why the customer will love this or will hate this, we will always get the project through management. Steve: Okay, but in terms of any sort of insights and contacts inside of Amazon to help you launch, did you guys take advantage of anything like that? Steve: Oh why is that? Kai: Because like all the people we used to work with, they said, okay, they know everything; they don’t need an account manager. So basically — imagine obviously we had the advantage to see all the internal figures, internal data of other people or other sellers working there. Steve: Sure, I was just wondering if you guys got by like sat around the water cooler and saying, hey, these leather cases are really hot, we need to get into that, because you have access to that data. Kai: But there are a lot of products we have access to, but as I said it’s not the access to data or the information that’s really the use of it and really doing it. Steve: Okay, so let’s start from the beginning then with your cases, you just mentioned to me earlier that you didn’t start out with a leather case; you started out by testing something, a plain old case. So was this just a generic case that you sourced from China or something like that? Kai: Exactly, we started out with a simple plastic case we sourced on Alibaba, because we just each didn’t have $1000 and yeah. In order to get enough products, we put the money into the product and then just sourced via Alibaba and via email. Steve: And what was the purpose of this test because it wasn’t anything close to your final product, right? Steve: Okay, so the logistics basically? Kai: The logistics, so then the second part was what do we need company wise, which company do we have to establish? What kind of taxes do we have to pay, where? So the second biggest part and the third part obviously was how do we get the product to sell on Amazon. Obviously we had all these figures, but we didn’t– yeah, we hadn’t been like the seller so far, so we didn’t know how did we do this. Obviously I was in working in this department, so I told people what to do, but I didn’t see what they actually did. We built up our own system and like promoting the product and generating traffic and marketing the product, so these 3 big things we basically set up with our test. Steve: Okay and in that first vendor selling the plastic cases, they weren’t the ones that manufacture the leather ones, are they or? Kai: This is what we recognized, we had one, it wasn’t a factory by the time it was an agent on Alibaba. Kai: When we started our real business with Kavaj we met this agent in China, and recognized we cannot talk, because we only communicated via email so far, and she was not able to talk in English. The boss of the factory of the agency wasn’t able to talk English either, so our relationship was finished once we met in person. Steve: Okay, let’s talk about these plastic cases first. Steve: You listed them on Amazon how did you– it seems like they were just generic cases right that all the other guys were selling as well, so how did you get rid of those, or how did you move those in the first place? Kai: Exactly, it was a generic case, we just proto did a simple generic name on it and RAR14, and then we listed the product. The first one we did is really we listed the product, we optimized like the whole product detail page. Kai: And we named all these information which are for free on Amazon on the detail page, first the title, the bullet points, the product description, the search key words, and the images is one of the most important parts, is the images. This is where we really had like the lack of founding a company very early, because we tried to find someone who took images like for our budget. We emailed 20 people around our city in Munich, and they all offered us images of like $1000. It’s a very high price for one, the shooting of high professional images. The other day one guy came back with a really cheap like $200 offer, and we first couldn’t believe it and in the end it was really a very professional photographer who used 2 or who’s doing photos for BMW and all these big machines, and he said he really like our inquiry. He was starting a business also like 30 years ago, and he decided to help us out if we come back again. He wanted to test our inquiry if we were serious about it. Kai: Then we got to him and we got really high, very, very high quality images, and I would say this is one of the key elements on Amazon. If you have really high professional images, you are way better than a lot of other of your competitors. Steve: From what I understand you stood out from the rest of the park because of your product photos at the time? Steve: This is probably almost 10 years ago then right or no not that long? Kai: No it’s like 6 years ago I would say. Steve: 6 years ago, okay. Kai: Yes 6 or 6 ½ years ago we did this, yeah. Steve: Would that work today like going back and trying to sell a generic case, I’m just curious what your opinion is on that? Kai: Yeah I think it still would work as a one shot, it still would work with this strategy, because it’s something a lot of people are doing like this one shot opportunities in several niches, because Amazon is such a huge market place. It’s going like when we used to work there like Amazon had 80 around 88 or something million customers. Today I just checked the favor it’s like they have 295 million customers worldwide. They’re just growing this so huge that I would say it would still work, and but what we did after that is what works much better is like to build a brand on Amazon. Steve: Are you still there? Steve: The tendency– so you had this one successful product in the beginning which was just like a rebrand of an existing product. How did you decide that that wasn’t good enough and that you actually needed to create your own branded product? Because a lot of people will just take that money and they go hey great, let’s keep this going? Kai: People nowadays after 4 years like they really look for our brand and the city combined. Then they find our case, this was of course like by chance, it wasn’t really planned out like this well, but now we have experience. We say okay, have you just started? The best way you can do this, build the brand from the start out, think about all your elements you can put into this. Steve: Just curious, you said you had no practice or any experience, how does one go about designing a leather case from scratch? Kai: Yeah. This is also pretty simple, because what we did is we took two weeks of our vacation at Amazon, and then we checked out okay, where can we go out to get ideas about a simple and genuine leather thin leather cases, where can we go? Then we checked out the fairs in Hong Kong and in China. Steve: Did you go to Global Sources also? Kai: Exactly we went to Canton Fair, Global Sources. Kai: And where all these suppliers meet 2 times a year and we went there to get ideas, so what was possible, and what exists. Then we met with a couple of– we did like our due diligence with the suppliers. After deciding which supplier would be suitable for us we went to the suppliers, and actually checked out their factories and met with the designers in house, because every factory basically has like the tech guys and designers in house, who are producing their design for the local market usually, and then we just talked as like as I said we wanted the case basically for us for ourselves. Kai: No, we didn’t specify any measurements because for the devices like the iPhone, the iPad, stuff like this, it’s all like you cannot change the dimensions, they are all given so to speak. Steve: That’s not what I meant, like if you wanted to put a little pocket on there, did you specify the dimensions, or did you let the designer give you? Steve: Were you in China the whole time during this iteration, or did you shift things back and forth? Kai: No, we were during our first order where we were in the first, we were in China all the time, so it was like a very fast process was kind of this, we did this. Steve: Wow okay. Did you, I’m just curious, did you commit to a large order before they were willing to do this for you, or did they just make these samples for you? Kai: They made the samples for us before committing to the core [inaudible 00:19:57]. Steve: How much did you have to pay for each sample? Kai: Nothing actually, because we decided … I think because we tried to build relationships, like really from the start. They also had the feeling, okay these guys are serious. They are here, they ask us for samples which nobody really does in this … Because we would spend, really, hours and then days there. I think they were like also sure that we would definitely buy something if they just deliver what we asked for. Steve: Yeah. That’s just a quick tip for the listeners out there. If you actually go to the fair and meet the vendors face to face, they’ll take you a lot more seriously. We found the same thing with our stuff. Clearly that’s something that Kai experienced with his case. Kai: Yeah, definitely, much, much, much more seriously. We’re going to China basically 3 to 4 times a year just to foster these relationships, and do it face to face. quantity for your first design? Kai: It was always 500 for every design. Steve: Okay. Did you start out with one particular model? Was it just for iPad and when did you decide to branch out to some of the other devices? Kai: Yeah, this Steve actually was one big mistake we made, because we actually knew that we had to focus on a few models or a few designs in order to be successful, but once we were there in China, we took vacations, and was first time order and all these hundreds and hundreds of suppliers and millions of people. We were kind of overwhelmed during the first days. Then we made the mistake to do 10, I think it was 11 designs for our first order. 11 X 500 different designs, and then also 3 different suppliers. Once we were back in Germany and we tried to build our system, we build with our test case; we recognized it’s impossible actually to get 11 different designs on page one of your main search keywords on Amazon, because this is the ultimate goal. Your listener should listen closely, this is your ultimate goal for all you do on Amazon is to have your main keyword, and to get this main keyword, your product, on page 1 of Amazon search results, and in the best case, 1,2,3, because this is where the magic basically happens. This is not possible with 11 designs. Steve: Right. Did you drastically cut back then, and only do a couple of designs per keyword I guess? Kai: We drastically cut back. Unfortunately we had to remove quite a lot of these first designs. We didn’t sell all of these. We cut back to maximum 3 designs per device, so we can claim slot 1 to 3. Steve: When you say 3 designs do you mean designs and colors, or do you just mean designs? Kai: I mean designs, and we do 2 colors, so basically we have maximum six products per device. Steve: The minimum order per color, per device is 500, right? Kai: Yes, nowadays are down to– we can basically order what we want, because we have really, really good relations with our main supplier, so it’s possible to get way below 500. Steve: Okay. Yeah. It’s like that with ours too, but I am curious when you’re talking with these guys … First of all what were your margins early on? Steve: On your first leather case. Kai: On the first leather case like it’s always around 50-70%. Steve: Okay. That’s interesting. I would expect it to be a little higher than that. Basically you were making around 3X it sounds? Kai: The thing is with genuine leather you cannot compare it to these cheap plastic cases. We have to buy at a much more higher price. In order to sell really big numbers you cannot price it higher than like $50-$60 on Amazon, because that’s like the matching price for on Amazon. After that it is just impossible to compete against the $10, $15 on the first page. Steve: I just want to take a moment to thank Bench Accounting for being a sponsor of the show. I love running all of my online businesses, but you know what I hate doing the most? Bookkeeping. Seriously, keeping track of receipts and expenses is easily the worst aspect of entrepreneurship hands down. And here’s where Bench Accounting comes in. Bench is an online bookkeeping service that pairs you with a team of dedicated bookkeepers who use simple and elegant software to handle everything for you. They’ll collect all of your financials and turn them into nice, concise financial reports. No more data entry, no more number crunching, and no more headaches. Plus, it’s reasonably priced. And the best part is that you can get 20% off of your first 6 months if you go to bench.co/mywifequitherjob. 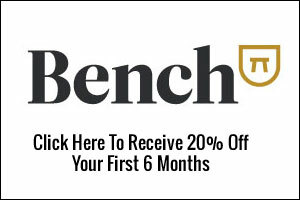 Once again that’s bench.co/mywifequitherjob to get 20% off of your first 6 months. Now back to the show. Steve: How did you guys know that you were getting genuine leather? Kai: We tested everything. Basically we asked a testing company to test all the stuff for is it genuine leather using no chemicals which could be possibly dangerous. Steve: You did your first production; let’s just say you did 500 units. Once you got those 500 units, did you have any defects? Did you have any issues, or did you just kind of list those on Amazon right away? Kai: No, we had like– not with the genuine leather cases we had no issues, but with two cases from the other designs we had issues because they were not packed properly. They got damaged. Almost half of them got damaged. Fortunately by the time we did the QC ourselves in Munich, we spent almost a day looking through 700 cases, and just throwing 350 away because they were just compressed, so we couldn’t sell them anymore. The thing is they just forgot something to insert into this case, so during transportation they just made the mistake. Steve: I see, so an inspection company probably would not have helped in this case? Kai: No, I don’t think so. Steve: Okay. Your first batch, it sounds like you had to throw away half almost? Kai: Yeah, half of one design. It was really one case … I don’t know how they forgot this, but it was this one supplier who forgot to insert something so that the transport wouldn’t harm the cases. Steve: You went through everything and then you just listed them on Amazon. You hired a photographer to take professional pictures? Kai: We still used the same photographer we had for our first test case. He was helping us out the second time, and the third time he said, okay, now you’re in business and I’m actually much more expensive. Please find another one. He was like really was time constrained and we found another really good one. Steve: What are your steps to getting the top 3 spots on Amazon search, because iPhone and iPad cases are an extremely competitive area? Kai: Right now we’re using tools. Back when we started we didn’t use any tools. We just thought okay, what are the top 3 main keywords our customers would search for? Only during our time we made this process better, meaning one thing like you said buy a software that can help you with this, but the easiest thing you can do, or your listeners can do is really check out what Amazon is suggesting when you type in your best keywords, because Amazon automatically fills in your search. For example if you type in iPads, you will definitely see iPad case as one of the suggestions, and these suggestions are like the main search terms in terms of volume, what is currently running on Amazon. If you do this like for example iPad case, you would see there’s iPad case and there’s very high volume search terms ‘iPad case leather’. If you type in iPad case leather, you will see iPad case leather and very high volume is iPad case leather black, iPad case leather brown. Only by checking out these automatic search suggestions, what Amazon is doing there, you can find your top keywords very, very easily. Steve: You mentioned you use tools today. Do you suggest any keyword tools to use? Kai: Yeah. We use MerchantWords. Kai: Yeah, we use this to just like search volume, and it’s basically our primary search tool. Another one we use is FreshKey, I don’t know if you have heard of it. Steve: FreshKey. Yes I have. Kai: These are basically 2 tools which can kind of automate this manual work to check out the Amazon Keywords. Steve: You’ve got your keywords down; can you describe the process of putting together the bullet points on your listing? Kai: Yes, of course. What we do is optimize first title, because this is like priority number one on Amazon, and second is bullet points, and we use … All keywords we’re not using on the title, we try to use in the bullet points because priority number two when you search on Amazon is bullet points. Most current information is that Amazon is currently changing its algorithm, and probably ranking the search keywords higher than the bullet points, but we’re just trying to figure out if it’s already happening or something like this. Until today we’re really optimizing the bullet points as the second step, meaning we put the keywords, we’re not using in the title. The second is we answer the five questions a customer would ask us in the store, in an offline store. Imagine you were an offline store and a customer comes in and asks, okay, what can I do with this case? We try to use customer language, and combine it with the keywords we found for product. Steve: Interesting, so what are the five questions that a customer asks about iPad cases? Kai: First, what can I use it for? Do we have stand functionality? Does it support auto wake up function? Can I access all ports? Does it match your other Kavaj products? It’s [inaudible 00:33:57] and that’s the good thing of building a brand. Kai: People right now, they really want like sets. They want Kavaj iPad, iPhone, iPad mini and now we started doing wallets, and they just combine everything and they just look for the brand, and then next product. Steve: You have your bullet points down, trying to use the customer’s language, answer commonly asked questions, what about your details, the product description? Kai: Yes. Product description, we also value this very, very high. We take the same approach basically. We try to use really customer language. We get this customer language before using and reading the reviews. What we did is we called a couple of customers and did quality interviews in order to hear what we’re really talking about our cases. What language do they use, and then we put together a product description and also stating the main benefits and really what the cases can do for them and help them in. For example they can use it for watching videos and doing presentations very nicely and to type on the case. It’s something like this, what Apple is also really doing nicely. Not putting out all features, but to really state, what can I do with this in real life? Steve: Just curious. Do you find that a lot of people read your descriptions and that it makes a huge difference? Kai: Yeah. You really have to specify. We think so but it’s the whole package of your detail page. If it really looks totally aligned, like images, everything looks professional. I think this is which makes the difference, because then people are checking out. It’s very hard to specify on Amazon, because we don’t have hard facts, hard data. I think in the long term, the customers will really check out the whole feature page, if it makes sense, the number of reviews, and the bullet points and they will come back and check out this. What we see a lot is really in the seller feedback ‘Product as described.’ This is like the best feeling you can get. If people are writing this or giving you this feedback, then they’re obviously reading it. Steve: Just curious in the very beginning, let’s say you have your listing down and everything is all good, how do you get it to rank? Did you start giving away products for reviews? What was your early strategy to get sales? Kai: No, we didn’t do like giveaways or something. What we knew from the beginning is we had to drive all traffic we can possibly get to our Amazon detail page, because we had these tests with one product. We obviously had only one product. Then we really tried everything. Every channel we can get and in the early days we even used Google PPC. We bought ads on Google, and then we built our own website and like putting the professional images there and building like a detail page for the test case already. Then we bought the PPC ads on Google, got the people to our website, and then we sent them to the Amazon detail page. Steve: That’s interesting. You’re paying for ads and you’re not taking the sale for yourself, you’re instead giving the sale to Amazon where you have to pay Amazon’s fees. So the rationale was that you want to rank on Amazon over your own site? Kai: Exactly. The rationale is really, we want to get our products into this magic page one of Amazon because as I said, Amazon, there are already 295 million customers who are searching there. The traffic you can get on Amazon on page one is all for free, because the people are searching there for free. If your product is on the first page of Amazon search results, you will get the traffic automatically. You just have to get there somehow, and then the magic will happen all along. Kai: No. No PPC traffic is profitable in the first place for us right now, I would say. It’s really, we spent– it’s really our strategy to spend there, and then get the sale and get ranked. Once we are ranked, like the sales of page one are coming in and supporting this initial spending on PPC so to speak. Steve: How do you correlate the two, because it’s not like you can put a conversion pix on Amazon site. How do you know that the sales are actually coming from PPC? Kai: We don’t know, but in the early days when you don’t have a ranked product, or if you put in a product in a category like iPad cases, you have one million results, no one will find your product if you don’t do any kind of either PPC, or getting all the traffic you can get from other sources to your products. It must be from somewhere. What you do doesn’t matter actually, but if it’s PPC, or if you like have an email list, or if you have YouTubers, bloggers talking about your product, but it must come from somewhere else in our category. Steve: Interesting, okay. What were some other ways that you drove traffic to your Amazon listings early on? Kai: Early on what we did is we got in touch with YouTubers and bloggers through influencers basically, and gave them samples for free. They did a review for our products, and then like posted these on their channel, and obviously linked on their channels to our product. Kai: On Amazon exactly. This was one very, very good way to promote it. Steve: How did you find these people? Did you use any services, or did you just reach out to people on YouTube? Kai: Exactly. We just reached out to people on YouTube, and basically what happened was like they reached out to us. Somehow they found us later. It wasn’t kind of that we put this much effort into it, but we would recommend to do this much more right now. I know that there are even services nowadays who can connect you with famous influencers. I think you even had one guy on the show who was very successful for this kind of strategy. Kai: We didn’t use the services, but we definitely will look into this. I hope this information– this could be a very good strategy. Steve: Can you comment on driving all that traffic to Amazon where you have to pay the 15% fee on top of FBA fees as opposed to taking it on your own website, saving that 15% and having Amazon for full regardless? Kai: Yeah of course. Our strategy is really the thing to get ranked. Your sale on your website is one sale on your website. The sale on Amazon is one more sale than your competitor, and this means Amazon will rank you higher, because sales and traffic is the most important you can get on Amazon in order to get ranked. In the long run, or we see it with our products, this will benefit your products in terms of ranking. Once you’re ranked on Amazon, you will just get the sales, first of organic traffic on Amazon instead of the sales on your website where you always have to drive the traffic to your website, and will always cost you money to drive this traffic to your website. On Amazon, once your products are ranked, you will get all this organic traffic from Amazon and these organic sales, which makes a huge difference, because you will never get 295 million customers on your website so to speak. Steve: Interesting, so do you collect emails, like how do you, do you do any marketing outside of Amazon then? Kai: We started this way too late actually. Kai: This whole email thing, nowadays when we last priced we use email as one of a big external traffic drivers as well, so we would recommend to use email very, very early on and try and start building a list so in order to spot your launches. Steve: How do you entice people to give you their email because you can’t get it from Amazon right? Steve: I assume you’re doing some sort of promotion outside on your own site? Kai: We just give them like a $5 coupon code, once they give us their email address, and this which is valid for all Kavaj products. Kai: Exactly and we place this very prominently on our website, so like nowadays. Steve: I see and then you send out an email and then you drive those people to the Amazon listing, and that in turn boosts your Amazon rankings, because that leads to sales? Steve: I see so you’re going all in on Amazon basically? Kai: We’re going all in on Amazon, all in. Steve: Have you had any problems with Amazon? Steve: Can you just go through some of the common problems that you faced? Steve: Okay, how do you deal with that? Kai: Basically I just describe what happens, we have 2 colors for example one iPad case black and brown, and then from one day to the other there, well there’re like 20 color variations like red whatever, blue something like this. It’s a different seller we didn’t know who cannot connect; it’s just hijacking of our listing, and benefiting from our sales rank probably. What we do is we registered our trademark and our Amazon brand very, very early on, and we contact Amazon either the support team or the service performance team, and just proving that we are the manufacturer of these products. We are the only seller of these products, we have the brand registry, we have the trademark, and we have the EAN code on our website which only shows that we are selling black and brown cases. Then we ask please remove the seller, please correct the listing and this usually works within 24 hours. Steve: You in this regard you mean they put up a different listing, not sharing your Amazon number, right? Kai: Yes exactly, they are just extending our listing variation to more colors, yeah. Steve: I see, but what about the ones you piggy back on your exact product number, how do you get rid of those people? Kai: We didn’t have this kind of thing so or so to speak, we have our sellers who try to sell these products, but are only very, very limited number, and it’s not a problem for us basically. Kai: Because they’re usually either selling like used or something, or they are selling higher prices. Kai: And they are not, they cannot do FBA because we don’t sell them so. Kai: Yeah this is basically it, second problem is, or any question to this or? Steve: No, no I’m good yeah. Kai: Like the second very common problem is that Amazon is just removing our product from the platform from one day to the other without noticing us. And this usually happens during Christmas season. Steve: No, you mean just a complete removal of your product you mean? Steve: No, we haven’t seen that yet. Kai: Okay and this can happen pretty easily because Amazon has a process called [inaudible 00:47:35] court. Which means if one customer either one customer is complaining about the same issue twice, or if 2 or 3 customers are complaining and talking about the same issue in a very short time period, like the Amazon guideline is pull [inaudible 00:47:55] and take the listing off line and to protect the customers, or basically the future customers in order to experience these kind of issues. Steve: Do they, does Amazon at least warn you that this has happened, or did you have to just notice yourself? Kai: We have to notice it ourselves, so Amazon like we didn’t really fully understand how this works, sometimes they notify us, sometimes they don’t, so this is why we always recommend to monitor your listings very well on Amazon to also keep an eye is everything online. Especially your top sellers are they still online, because as I said it can happen pretty fast. Yeah if just two customers are saying, okay I have this issue and the next comes I have this issue, like there’s a red light internally yeah on Amazon. The solutions also contact the Amazon support staff and then the Amazon service performance team and explain what happens. The best case you know what happens if they notify you. If you don’t know you have to just guess what happens. Kai: We had one example story from our products was we used to wrap all our cases into a wax paper, and at the beginning we only used black wax paper also for our coniac [ph] brown cases. People got these coniac cases, but saw okay they look black; I ordered brown, why does it look black. They just didn’t unpack the case, so they just saw the black wax paper, and figured okay this must be a black case, it’s a mistake. They made it like Kavaj made it. They just reported us to Amazon that we shipped the wrong case, and if you ship a lot of cases during Christmas time, it’s very likely that two customers are not unpacking these cases, and then they’re just complaining at Amazon. This happened actually three times to us, and we always explained please check the bin, please unpack the case, the customer just had forget to unpack the cases. Kai: After three times we learned the lesson the hard way, we changed the packing material and now we wrap everything in their respective color brown or black. Steve: Okay, that’s a good story. Hey Kai we’ve been chatting for quite a while, I understand you have a couple of other projects on the wing that I thought that you might want to mention. Kai: Yeah definitely yeah, we got a lot of questions during our time during last couple of years because we built like Kavaj only in only 4 years, and we build a global brand in UK, US and in Germany, and people came to us saying how did you do this actually. We quite, we had quite a lot of people already in Germany and the UK and US and helping us out with explaining, just explaining what we did. Then we figured okay we can share our knowledge like our experience from working in Amazon and building a brand, and what we did is we wrote a book and we put our whole story together. Steve for your listeners they can just go to kavajacademy/book, and they can get our book for free there. Kai: We’re building like a whole Kavaj Academy around this topic selling on Amazon, because we saw there’s huge demand really how to sell on Amazon. We really love to get the feedback we already received from this book, and what we did with Kavaj Academy already. Kai: This is the second biggest thing we do currently besides Kavaj and expanding Kavaj internationally. Steve: If any of the listeners have any questions for you Kai, where can they reach you? Kai: Yeah, obviously as I said they could just go to Kavaj Academy, and we have a Facebook group, or a Facebook profile already for Kavaj academy, this will be probably the easiest way to get in touch with us or working. Steve: Okay, sounds good. Well Kai thanks a lot for coming on the show. Kai: Yes, thanks a lot. Steve: I must say I think you are the first person who I’ve interviewed who drives all of their traffic from their own page to Amazon for ranking, so I found that very interesting. Kai: Yeah, it is definitely very interesting, and it’s working, and all countries we use to do the strategy. Steve: Yeah, awesome well thanks a lot. Kai: Yeah, thank you Steve for having me and thanks for the interview. Steve: Hope you enjoyed that episode. Kai’s story is truly amazing, and it just goes to show that you don’t need any business experience whatsoever to start a 9 figure business. All it takes is some initiative, a lot of hustle and a strong desire to learn and adapt. For more information about this episode, go to mywifequiteajob.com/episode 107. And once again I want to thank famebit.com for sponsoring this episode. As I mentioned earlier Famebit is the best place to find YouTubers, Instagramers, and other influencers to promote your products online, and it works. One of my podcast guests Emanuel Eleyae used famebit.com to make over $65,000 in 4 months with YouTube influencer marketing, and it costs as low as 50 bucks to start. 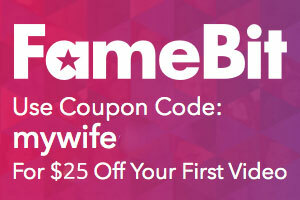 And the best part is if you use coupon code mywife@famebit.com, you will automatically get $25 off. Go to famebit.com right now, and get famous YouTubers to promote your products online. And finally if you’re interested in starting your own online business, be sure to sign up for my free 6 day mini course, where I show you how my wife and I manage to make over 100K in profit in our first year of business. Go to mywifequitherjob.com for more information, sign up right there on the front page, and I will send you the course right away via email. Thanks for listening. Outro: Thanks for listening to the My Wife Quit Her Job podcast where we’re giving the courage people need to start their own online business. For more information visit Steve’s blog at www.mywifequitherjob.com.